If you read my last fashion post then you may know that I'm tall. Although I don't mind being tall so much now, as there are a lot more taller people around than when I was younger, at school I hated it. Girls grow taller quicker than boys anyway, so being a tall girl meant I was taller than pretty much everyone else, including some of my teachers. Luckily my best friend was pretty much exactly the same height as me, so I didn't feel too much of a freak. One of the worst things about being tall back then, apart from the usual 'What's the weather like up there?' and similar comments, was trouser lengths. I just had to live with the fact that my choices were skirts or trousers that flapped around my ankles. As I've got older I've been delighted to see high street stores such as Topshop, Dorothy Perkins, New Look and even Primark introducing tall ranges. Some still need to follow suit, but I have a lot more options now than I did as a teenager. What I still don't understand is that we're gradually getting taller, but yet some stores only offer standard and petite ranges, it just doesn't make sense to me. I can't remember exactly when I discovered them, but at some point I came across Long Tall Sally, a shop that only sells clothes for taller ladies and that has actually been around for over 30 years. When it comes to making longer length clothes it's not enough to just stick a couple of extra inches on the bottom of a pair of trousers, all proportions have to be adjusted for a longer body, and this is what Long Tall Sally do. Their jeans and trousers are available in 34", 36" and 38" lengths. As I was already a fan of Long Tall Sally I was delighted to be contacted by them asking if I would like to attend the launch of their High summer collection. Unfortunately I was unable to make it down to London to attend this as I can't currently afford to make the trip down from the Midlands unless it's for paid work, but instead I was asked if I'd like to review one of the items from the collection. 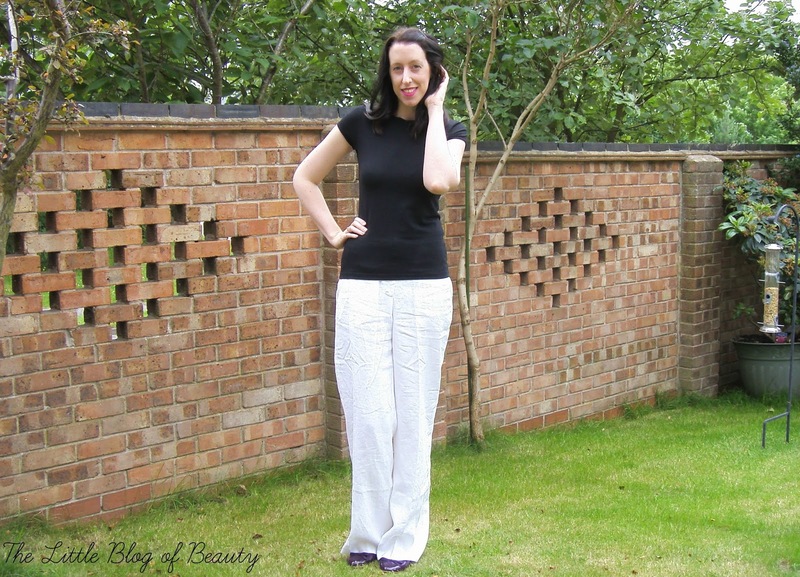 After having a look through I decided to try the Pocket detail linen trousers*. Although I love wearing skirts when we do actually get some sun in the UK you don't always want to have your legs out (of course I mean when you can't be bothered to shave them!) 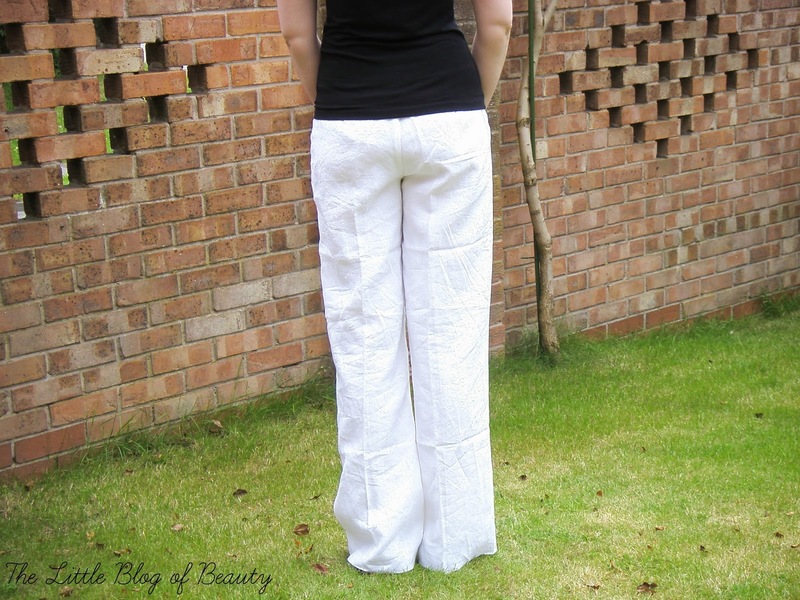 and jeans are far too hot in the summer so linen trousers are perfect. 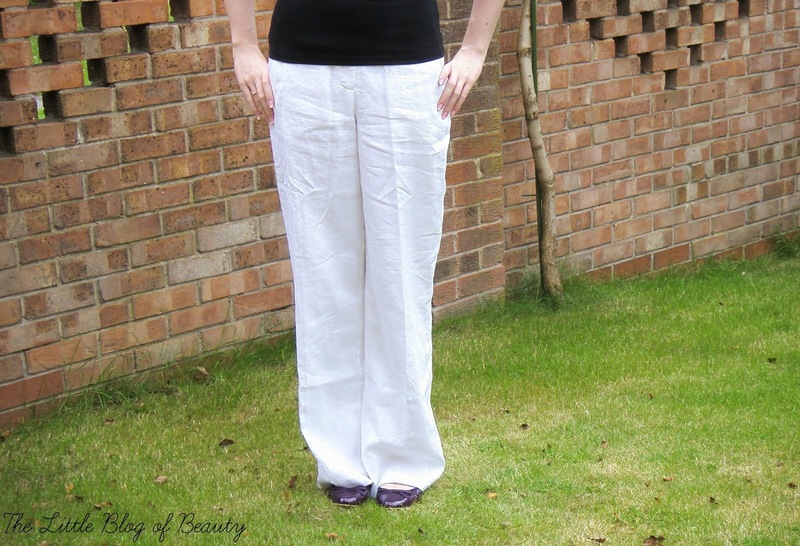 I had a couple of pairs of linen trousers a few years ago (one of which were from Long Tall Sally) that I had to give away when I lost some weight and could no longer keep them up anymore. I haven't been able to replace them since so I was excited to be getting a new pair. These are available in five different colours (black, white, blackcurrent, ultramarine and clay) and I decided to go for the white (I've got my eye on the blackcurrent ones as well!). Obviously with white there's always the worry that it might be see through but these are fully lined and although I wouldn't recommend wearing dark underwear underneath, they aren't see through. 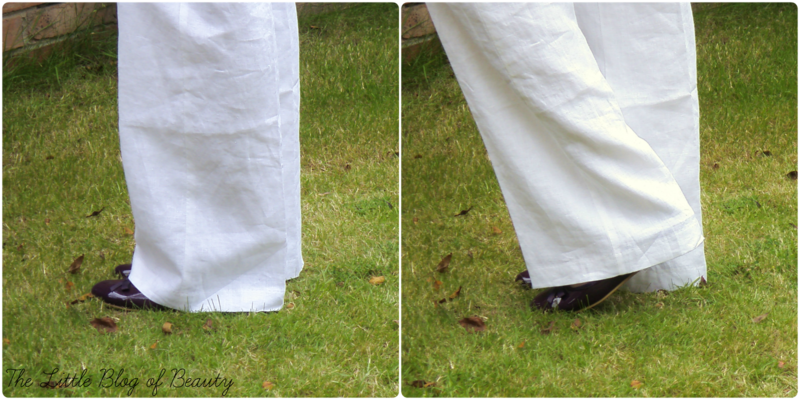 Apologies that they look a little creased in the pictures but linen trousers do crease easily and I'd sat down in them before taking the photos. These are a size 10, which is my usual size in trousers (for some reason in jeans I'm usually a 12) and they're very comfortable. A problem I sometimes have with clothes that aren't cut for taller people is that there's not enough length between the waist and the tops of the legs, to try and put this as politely as possible, the crotch of the trousers is too close to your underwear. I don't have that problem with these trousers because there's extra length between the waist and the crotch. They're very well made, all the stitching is neat and doesn't look like it will unravel and the waist is finished with a ribbon effect securely stitched all the way round. They fasten with two hooks but also a button to make them feel secure. Although I'm tall, coming in at about a cm under 6ft, I haven't actually got particularly long legs and some tall ranges are too long for me, although obviously standard length ranges are too short. So I'm kind of a short tall person! My inside leg measurement is probably between 33.5" and 34" and these are about the perfect length, maybe just slightly too long as they do actually sit on the ground. They will probably fray over time, but I don't mind this for having the length and I also could have them taken up slightly if I wanted. I usually like to wear linen trousers with a simple T shirt or vest top, although I wore a black T shirt for these photos I wouldn't usually wear black when the suns out as it's far too hot. These would also look nice with one of the really pretty cami's that are in the shops at the moment, either in a summery print or a bright block colour. I'll hopefully be heading into town this week to find one I like. Shoes wise I go for a pretty pair of ballet pumps or some delicate strappy sandals. Although Long Tall Sally items are a little more expensive than you might pay in most high street shops you are paying for good quality. I've actually had a couple of pairs of their jeans for around three years now that I wear a lot in the winter and they're still going strong. Before these ones I had some other pairs I'd also had for years and the only reason I got rid of them was because, as I mentioned above, I lost weight and couldn't keep them up anymore. I also regularly receive 30% off with free delivery and returns offer codes which is a fantastic saving and makes them a little more affordable. The Pocket detail linen trousers were £60 but I'm delighted to see they've now gone in the sale with prices ranging from £35 to £50. If you'd like to grab yourself a pair you can find them here. Do you have any problems with finding clothes to fit?